We no longer have cattle as of December 2017, although we’ve had Jerseys and Irish Dexters in the past. As much as we loved the meat and milk, their size made them more challenging to handle than sheep and goats. 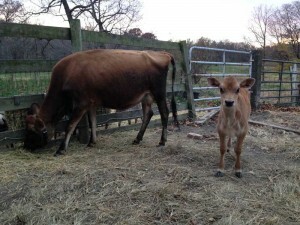 For two years we had a Jersey milk cow named Beauty. We bought her and her bull calf Beau in October 2014 from PrairiErth Farm in Atlanta, IL. We had fun making cheese with Beauty’s milk, and we’d give the extra to the pigs. Beau went into the freezer when he was about a year old, and we are very happy with the beef produced. Beauty calved again with a little bull on May 31, 2016. 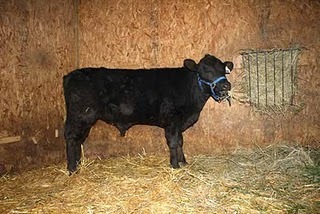 We had Irish dexter cattle on our farm for about ten years because they’re triple purpose. Considered the ideal family cow in their homeland, they were historically used for milk, meat, and oxen. Dexters appealed to us because they thrive on grass alone. Throughout the ages, cows and other ruminants ate nothing but grasses — no corn or soybeans, which is what modern milk cows are fed, because it increases production. Grain, however, is not good for cows, the people who consume their meat and milk, or the environment. We bought our first Dexters in 2002 shortly after we moved to the farm, and although they produced nice calves, they were not friendly enough to be milked, so we sold them. We enjoyed the grass-fed beef we had from their calves though, so we decided to try again. We also wanted to increase our cheesemaking repertoire by adding cows milk cheeses, butter, and sour cream. Since goat milk is naturally homogenized, it’s a challenge to make anything that requires cream or skimmed milk. 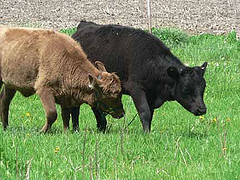 In May 2009, Molly and Bridget came to live at Antiquity Oaks from Five Ponds Farm in Missouri, where they were born. Bridget is the black one, and she is naturally horned. Molly’s color is called dun, and she is polled, which means naturally hornless. We added a polled bull to the farm in 2010 named Jaxon, pictured below, in hopes that most (or all) of our calves would be born naturally hornless. Although these cows were much friendlier than the first ones we bought, we never got into the habit of milking them regularly and decided to sell them in July 2013. It was still a tough decision to sell them, however, because the grass-fed beef from their calves was delicious.